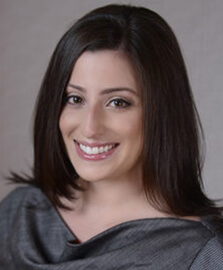 Dr. Danielle Lombardi is proud to be a graduate of NYU, where she attended dental school as well as completed her specialty training in pediatric dentistry. Dr. Danielle strives to create only happy memories of visiting the dentist! Her passion for working with children has brought her to Park Smiles NYC Pediatrics, where she is pleased to be part of the team to provide a positive, safe and fun environment for her patients. A native New Yorker, Dr. Danielle Lombardi was born and raised in the Bronx. She earned her BA with honors in Biology and Psychology from Manhattanville College in Purchase, NY. Dr. Lombardi was granted the Dean’s Merit Scholarship at New York University College of Dentistry, where she earned her Doctor of Dental Surgery degree. Through her volunteer activities and patient interactions during dental school, she realized what she had always known, that she loves working with children! Dr. Lombardi continued her education by completing a combined academic and hospital based residency in Pediatric Dentistry at New York University and Bellevue Hospital. During her specialty training, she received a wide range of experience working with children with craniofacial anomalies, developmental disabilities, as well as medically compromised children with cancer and blood disorders. She has participated in several local and international outreach programs to Kathmandu, Nepal, Sololá, Guatemala, Machias, Maine, and Poughkeepsie, NY to provide pediatric dental treatment, education and training to underserved communities. Based on her own great experiences at the dental office as a child, Dr. Lombardi understands the importance in working individually with each child in order to promote a lifetime of good oral and dental care. When not in the office, Dr. Lombardi enjoys traveling, soul cycle, reading, and spending time with her family, friends, and bulldog Chloe.